If you’re considering going out on your own, starting a consultancy, or setting up a small business based on your expertise, let me share some nuggets of wisdom with you. I’ve been doing this since the end of 2012 and GEE WHIZ do I wish someone had sat me down and had this chat with me before I started. If you’re after a quick read, scroll down the bottom where I get straight to my top three tips. If you want to know how I learnt the hard way (and possibly get a few pointers on how to avoid doing the same) carry on reading…. So the original title of this article was ‘Why multiple organ failure was the best business move ever’. If you’d told me that I’d be saying that when I was 17, the first time I had a life changing thunderbolt strike me, I’d have told you you were nuts. That 20 years has been a right laugh – and a right trip – and ending up at the pinnacle of my career, doing work I loved, on a remote coral atoll essentially cut off from the rest of the world, is what lead me to a medical evacuation – my physical body had given up, and it was the point at which I knew that something had to change. But let’s go back a bit to where it all started. I started off life in a small country town, born to hard working business parents who started a business with the help of family members and a broken down Dodge truck. We were raised to know the value of hard work, determination, and how building a reputation takes years of service and dedication to the cause – whatever that cause might be. I was sent to boarding school so that I could get a better education than what was on offer at the local schools of the time, and at the age of 16, won a scholarship to go and spend 3 months with a host family in the north of Italy, learn Italian and study at a local high school. That 3 months had me returning home to finish my last year of school determined to do one thing – make my career, whatever it was, based on being able to travel, learn languages and get to know new cultures. I was hooked. I remember standing at the doors to the boarding school, watching teachers come and go on the first day back and school, and thinking ‘there’s got to be more to life than this. There’s got to be more than 9-5, office jobs, and living in the suburbs with 2.2 children, a dog, and a red Sportswagon.’ Not that there’s anything wrong with any of those things. It just wasn’t what I wanted. I went through the motions of university, not really knowing what I wanted to do or how my life was going to play out but I was convinced that if I got an initial degree in something, that the rest would fall into place – and that’s exactly what happened. I double majored in languages and spent another 6 months on scholarship in Indonesia, finishing my degree at a university in Yogyakarta. Being evacuated amidst gun fire and beheadings did nothing to dampen my enthusiasm for travelling, much to my parents’ exasperated cries of BUT WHY? Why can’t you just get a normal job and live in a safe country?. I came back to Perth to finish my degree and get my first teaching certificate. I wanted to travel, I wanted to work with other cultures, I wanted to learn more languages and soak in other cultures and so that was the beginning of the next 15 years on the road, doing just that. 12 overseas postings, 33 countries, I saw so much. I worked, I travelled, I lived, I loved, I learnt more about the world, and about myself, then I even knew existed. I knew I needed to get out of the classroom and so upgraded my qualifications so that I had a piece of paper to reflect what I had learnt on the road. Getting that Masters in Education was what lead me into more senior roles on curriculum development projects, teacher training and training liaison positions, and ultimately into two project management positions, the later of which took me to that remote piece of coral in the middle of nowhere. You know what I realised by the time my organs were failing me, and I was recuperating in cold, grey Melbourne? I’d done it. I’d worked my way up to the top of the food chain – I’d worked for every size company there was – family run, government, major corporation, and everything in between. I’d held every position from teacher, to teacher trainer, to project manager and everything in between. I’d been through 33 countries, worked with over 80 cultures, learnt 5 languages, and still wasn’t happy. It didn’t matter what project I was working on, who I was working for, or where I was working – getting outcomes for my clients was always at the top of my priority list but never really mattered to the people who were paying me. Budgets, manpower, stupid rules and pointless regulations always stood in the way of me being able to deliver the sort of training that people REALLY needed, that would actually SOLVE the problems they were experiencing, but what really mattered to the corporations, the universities, the businesses – was money. Money, power, prestige or something else that didn’t mean a thing to the clients that needed the help – but that stopped me from being able to deliver what it was they truly needed. So things had to change. I decided that there was only really ever going to be one way to help people properly – and that was to go out on my own. And that I did. 2012 I signed up for some business training and I’ve never looked back. Well, that, strictly speaking is a lie. I have looked back, and thought ‘what the hell have I gotten myself into? Was the 9-5 life really that bad?’ The answer might surprise you. It’s been the toughest 4 years of my working life without a shadow of a doubt. Building a business is the ultimate personal development journey and I’ve learnt more about myself, life and people in general in this 4 years than the 15 years I was on the road. I’ve studied, I’ve put my heart and soul into a business that I had to shut down a year after opening (nothing like a major university replicating your business plan – down to the logo even! haha!) but I’ve picked up the pieces and carried on. I’ve spend the last two years honing in on exactly what it is that I help people with – what I’m strongest at – and finally have a website and a suite of services that reflects that. Mum and Dad were right. They raised us while running a small business, and were right when they said that building a reputation for yourself is not something that comes with a click of the fingers or out of thin air. It takes time. It takes dedication to a cause. It takes a shed load of hard work and sheer determination to succeed, but it’s SO FREAKING WORTH IT. If you’re thinking about going out on your own, for the same reasons that spurred me to make the leap, JUST DO IT. It’ll be the biggest investment in YOU you’ll ever make, probably the biggest investment of time, money and effort you’ll ever undertake, but the result? Getting to the place where you know you can help people, on your terms, in a way that serves you AND your client, is priceless. all focus on making sure you have a strong support network around you. I spent the first few years head down, bottom up, working in front of a screen and never really asking for help, reaching out to other small businesses or networking with local groups. I was sucked into the vortex that online business can be, and in doing so unfortunately cut myself off from having real connections with people, and being supported in real time. Sending hugs and kisses online, asking for advice in forums is one thing… reaching out to a group of human beings, in person, and getting their advice (and hugs if that’s what you need) is a completely different ball game. I found that working on a business, from home, online, alone, was one of the most isolating experiences I’d ever had – and this is coming from someone who spent 2.5 years on a remote Pacific atoll essentially cut off from the rest of the world. Ask any small business owner: real, live connections are at the heart of staying sane when you’re running a small business. So what are my top three tips for anyone wanting to take the leap I did? Yes, there’s lots of free stuff on the internet that can help you learn what to do, but getting a coach was the best investment I’ve made on this journey – what they can do for you is not countable in money terms. They take the stress, confusion and worry out of what to do next, and help you drive that business bus. Going out on your own doesn’t mean you have to do it all alone. Seek help – from someone who is further along in the business world than you are – and let them take some of the stress out of which direction you should be going in and how to get there most efficiently! 2. Join a mastermind or support group. Find other like minded people and spend time with them. It doesn’t matter how much you love your friends and family, running a small business kicks up a whole heap of issues only small business owners can sympathise with – spending time with them gives you back a piece of your sanity and helps you move through the blocks and issues you’ll inevitably come across – and working with others who have been where you’re at gives you such rich advice and support – you’re mad not to! 3. Self care: don’t let the bad days get you down. You’ll have them. We all do. You’ll have days when you want to throw in the towel and run screaming for the hills, thinking ‘why on God’s Green Earth have I done this to myself? 9-5 would be SO MUCH FREAKING EASIER!‘ Have the tanty. Do something that makes you feel good. Practice some self care and remove yourself from the work station for a few hours – or a few days – and spend time doing things that light you up. Colour in. Do some yoga. Sleep on it. Play some music. Bake some cookies. Sleep on it again. In the morning remind yourself why you started and just CARRY ON. You’ve got this. that takes you through a step by step approach to finding the right coach, support groups, and a self care routine that will support YOU in running your small business? I’ve prepared a very thorough worksheet complete with worked examples so you can get started straight away. Click on the above link to be taken directly to the Lesson. 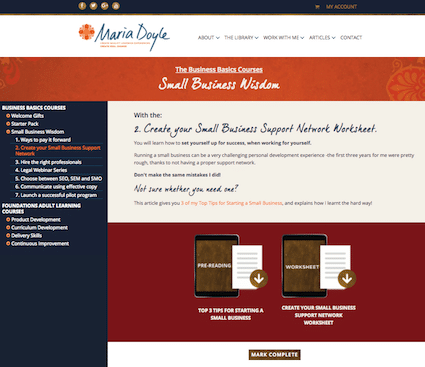 If you’re already a member of the Small Business Wisdom course, make sure you’re logged in! If you’re not, you’ll be redirected to the page where you can become a member. ← What do Curriculum Developers do? They make Content Development easy! Wow . . . just WOW!! What an amazing insight into such an inspiring woman. Thank you for sharing your personal journey. If I didn’t ALREADY admire you as a person, I would be well and truly be a fan after this wonderful blog post. Awesome post Maria! And welcome back to Oz! Such a great post! Thanks for sharing your amazing story. Incredible! What an amazing journey you’ve had!